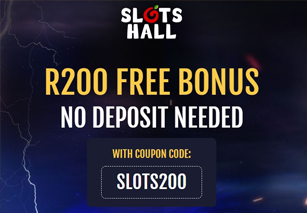 There are a number of new online casinos targeting South African players and one of the newest and hottest is Slots Hall Casino. This casino was launched in 2019 by Sea Gate NV and is rapidly gaining popularity among South African players for a number of reasons. The first reason is of course the ability to pay in Rands, which means you are spared the bother of converting your money into any other currency. Then there is the stable and reliable software powering it. The game range is extensive and you can play them from multiple devices, including desktops, laptops, smartphones and tablets. There are multiple exciting promotions as well, starting with an exclusive no deposit bonus of R200. The R200 no deposit bonus is exclusive and available to you when you visit SlotsHall through our website. The bonus is available the moment you sign up with the casino, even before you make a deposit. You must use the coupon code SLOTS200 to claim this bonus. You can use this bonus to try out the games at the casino in real money mode without spending from your bankroll. Read our detailed review of SlotsHall casino to learn all you need about playing here and having a great online casino experience. SlotsHall casino is available for play not just from your desktop but your smartphone or tablet as well. This is possible thanks to a fantastic mobile optimized version of the casino that allows you play your favourite casino games on the go. The game quality is excellent and you get full HD quality graphics. You can access the mobile casino from an Android, iOS or Windows Phone device. Game play is no different from when you play on your desktop, except that the screen size is bigger on the desktop. The use of HTML5 technology in game development guarantees a responsive interface that ensures all the elements of a page fit perfectly on the screen of your device regardless of screen size. All the standard promotions are available at the mobile casino. While you don’t get the full complement of games on the mobile casino, there are enough to keep you engaged. You get a good selection of slots, table games and video poker at the mobile casino, and you get to play some cool progressive and fixed jackpots as well. The Cashier is enabled for mobile transactions, which guarantees smooth payments and withdrawals. SlotsHall casino is powered by software from Real Time Gaming (RTG). RTG is one of the most reliable and well-known software providers around. The software is available in download, instant play and mobile casino modes. You get all the games for real money play as well as free practice play. The games available include slots, table games, progressive jackpots, specialty games and video poker. The slots are based on a wide range of themes and there are 3-reel slots, 5-reel slots, 6-reel slots and also progressive slots. You can search for these games individually, by bonus rounds or by floating symbols. New titles are added regularly, which means the game portfolio is constantly increasing. All games at the casino are fair; the casino’s software is tested and certified for fairness and randomness by Technical Systems Testing (TST). The casino uses 128-bit secure socket layer (SSL) encryption technology to provide a completely secure gaming environment. First deposit: 200% up to R10,000 and 20 free spins (Use coupon code WELCOME1). Second deposit: 150% up to R10,000 and 30 free spins (Use coupon code WELCOME2). There is a fantastic loyalty program and a range of special bonuses and promotions, including daily bonuses, weekly bonuses, weekend bonuses, free spins and more. Slots Hall Casino guarantees secure transactions through the use of 128-bit SSL encryption technology. You can make payments in the South African Rand (ZAR) if you are a South African player. Players from any other country can make payments in Euros (€). You can deposit funds using credit cards (Visa, MasterCard, American Express and Diners Club International), Visa eVouchers, e-wallets (NETeller, Skrill and EcoPayz), EasyEFT and EFTpay and also Bitcoins. All deposits reach your casino account instantly. Withdrawals take a little longer. The casino strives to process all payouts within 24 to 48 hours. The maximum withdrawal amount at this casino is $10,000, and any payouts above $10,000, including progressive jackpot payouts, are paid out at the rate of $10,000 a month. WHAT DO WE THINK OF SLOTS HALL CASINO AS A WHOLE? Slots Hall Casino is one of the most popular casinos around currently for South African players in the short while it has been around. The casino looks great and comes with a fantastic interface that guarantees seamless navigation. There are some great RTG games to play, and you get a good bunch of promotions to play them with. There is a mobile casino as well for those who love gaming on the go. Payment support is excellent and you can make payments in Rands if you are a South African player. Rounding off all these features is some excellent customer support and a secure and fair gaming environment. Taking into account all these cool features, we have no hesitation in recommending SlotsHall casino to South African players.